Piper Verlag is a subsidiary of Bonn-based Media Deutschland specializing in fiction and non-fiction. It publishes around 500 new releases per year. 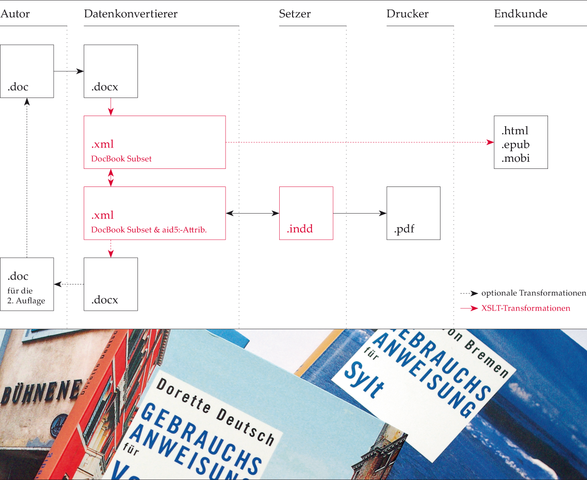 To create products for print and online use from author data, an XML workflow was developed for the publisher’s “Gebrauchsanweisung” (User Guide) range. Author data is converted to XML and typesetting and page makeup performed in InDesign in the usual high quality. All corrections from InDesign are automatically adopted into the XML data, which can be used to easily generate reflowable e-book formats such as EPUB in parallel with the print PDF.